The Catalyst Goes Green! It’s rare that I get to write about someone who has made a difference in my life. Someone that brings my emotions up and shows me how to write with passion. Sheila Neisler, The Catalyst has an amazing, and advanced look at marketing today. Her method of marketing is something I’ve been searching for, a long time. She gets me, I’m totally on board wit her marketing strategies, it works! I’m very grateful for Sheila and even more so that she shares my love of the environment. 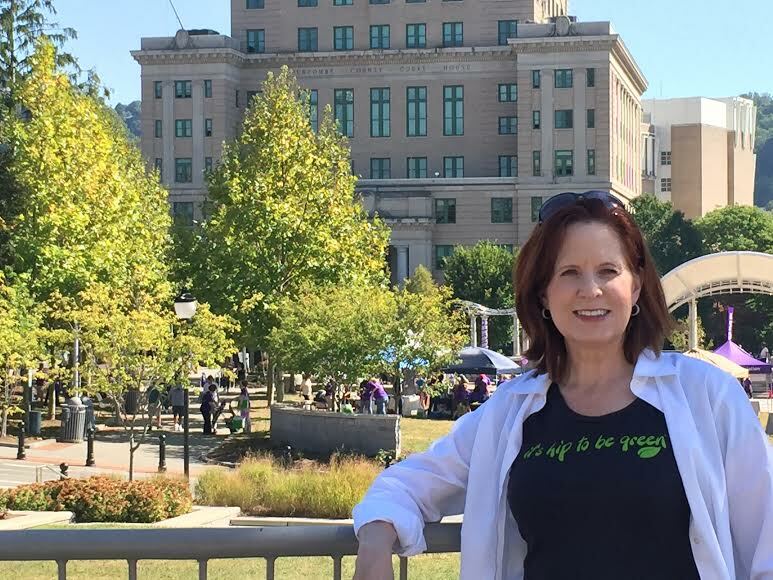 Sheila Neisler picture below, wearing our It’s Hip To Be Green, organic cotton T-shirt, at a local Alzheimer event in Asheville, NC my home. Sheila is very active in non-profits, community affairs, supports local area special events. She is a woman that walks her talk, is successful, and giving. She is certainly someone I aspire to be like. Using her 360 approach to marketing is not only no nonsense, it is just plain common sense. Her own story is the inspiration for her approach, she has the numbers to back it up, she knows it works. Her bright eyes, supportive way, and her energetic presence, brings out the best in her clients. I’ve seen her in action. For me, finally a marketing approach that makes sense, isn’t into sales pitches, one that is honest, works and is great for any size company. I’ve noticed that It’s Hip To Be Green has greatly moved forward, since working with Sheila. Here is a quote from her business card. Peter Drucker ” Marketing is not a function, it is the whole business. Seen from the customer’s point of view” This is Sheila’s approach. She does what works, instead of doing what everyone else does. She thinks outside of the mainstream approach, and makes it happen. While I’m honored to share with you, her work, I’m even more honored to work with her, and have her wear our signature T-shirts. Stylin Green, Hip & Chic as what we are is shown by what we exude in the world, our hair, make-up, clothing, our skin, all gives off a vision of who we are, what we stand for, and how better to BE Green than to show your inner beauty outwardly. Wearing our signature T-shirt is Annastasia, who lives to be Green working as a Hairstylist and Make-up Artist in the TV and Film world as well as being a Yoga Teacher with Moksha Yoga which also supports and educates people in helping the earth and our environment by working to make this world a healthier place to live everyday. Annastasia enjoys bringing her yoga lifestyle in the beauty world where the two can join together and create an environment where her clients and the actors that she works with can be true to themselves and the world we live in. To be green and healthy from the inside out. Our T-shirts fit perfectly as we also support what Annatasia works to not only live a Green lifestyle, but to educate others on how to live Green. Our inner glow comes from a peaceful, healthy inward world, and it shows in our appearance. 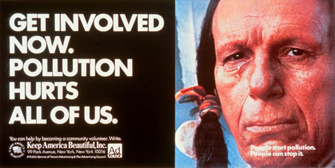 The same with our environment. Taking care of our world to support it’s health and well being for all of it’s inhabitants, will show an outward clean, green and sustainable world. Being Green is more than action, it is a state of being, a lifestyle. Stylin Green, Hip & Chic, Annastasia lives in Toronto, you can view more of Annastasia’s work on her website at www.hairandmakeup.ca. Her most recent projects is working on the hilarious comedy Schitts Creek and Feature Film coming soon, Goon 2. It’s Hip To Be Green is going Global. Buy one of our signature T-shirts! Give one for a gift. Share the excitement of Being Green. Buy Green Be Green Wear Green. Our dollar makes a statement! Where we spend our hard-earned money, shows our choices, our preferences and our support. This is why it is important to be an aware shopper. What we put our efforts towards today, will become our tomorrow. 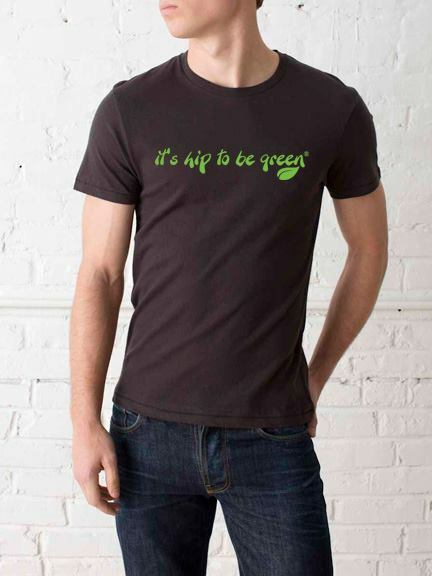 Our It’s Hip To Be Green ® Organic T-shirts definitely makes a statement! Not only with our trademark, but the manufacturing of the shirt, it is made in the USA, low impact dyes, Organic cotton and ethically made by high sustainable standards. We say Green, we mean Green! We walk our talk when it comes to Green. We are so pleased our signature shirts are making a statement in the music industry with talented and beautiful singer, song writer Melissa Rebronja also known as Emar. She sings in 7 languages, her songs are of peace, love, forgiveness and world unity. Melissa is a mufti-talented woman destined to make a difference in the world. As is our dreams of our new Organic clothing line. Melissa’s music stands for what we support in our efforts to bring awareness of a happier, healthier and more peaceful unified world. 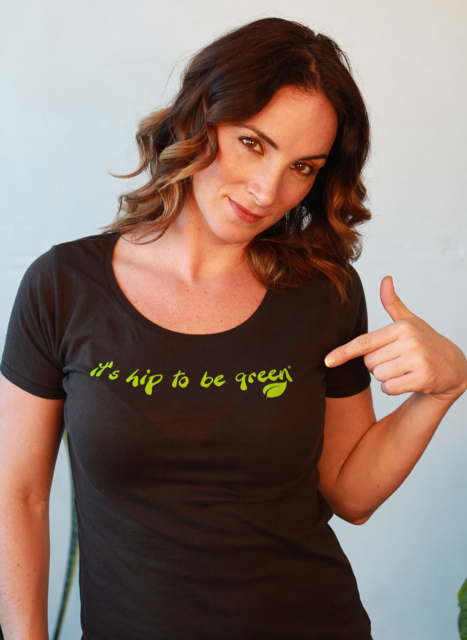 Show the world your support of a more peaceful, greener, healthier world by wearing one of our It’s Hip To Be Green ® Organic cotton T-shirts, the chic fitted design and low neckline make this shirt Hip! 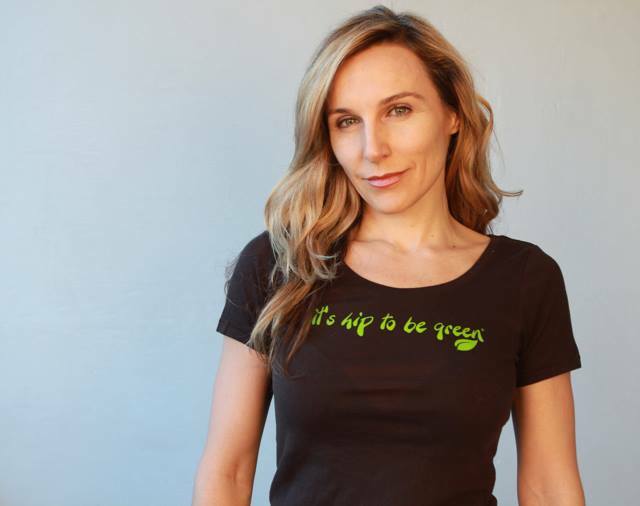 Comes in Men’s and Women’s sizes, made of the softest organic cotton, it will be your most comfortable shirt Make a bold statement, Buy Green Be Green Wear Green. Start the trend and show the world how important being green is. A new wave of Green is coming! It’s here. 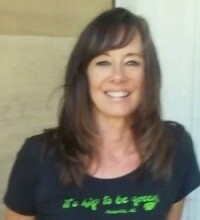 It’s Hip To Be Green T-shirts! Our long awaited T-shirt line is now available for purchase. We are so excited from the wonderful feedback we are getting from customers. They love the feel, softness, chic design and lower neck line. They truly are luxury T-shirts. 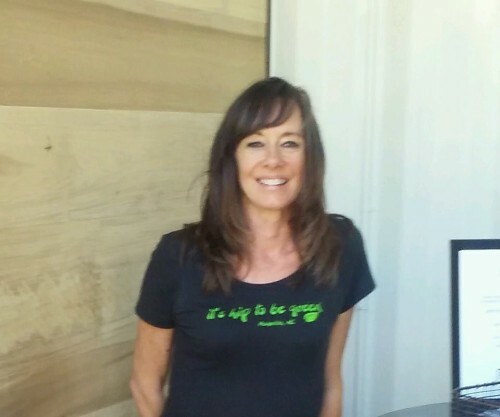 Made in the USA and ethically produced with high sustainable standards, and printed with low impact dyes, our t-shirts walk the talk on being Green! Affordably priced, they make a wonderful gift to show your support on the Green movement. 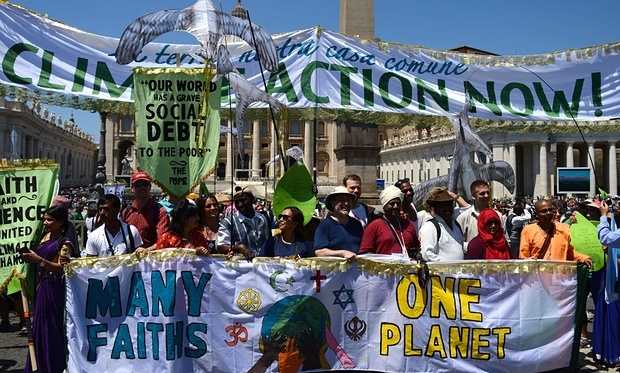 Be Green, Live Green isn’t just a fad, it is a not so new trend that is growing. Show your support, wear Green. Our T-shirts come in Men’s and Women’s sizes printed on 100% Organic cotton, Eco black color and It’s Hip To Be Green on the front. More styles and colors coming soon. We are so excited to be bringing our trademark brand to the market. Buy them now for friends and family, and one for yourself. Being Green is such an important message, it is an extremely important cause to get people on board, our hopes that this message will become more common, start a conversation and stimulate interest in creating a more sustainable, clean and healthy earth for ourselves and generations to come. It’s Hip to be Green! You can buy our T-shirts at www.buygreen.com or www.mypumpkindoodle.com. Why Organic Crib Mattresses ? Why organic crib mattresses? As an expecting parent with an overload of things to get ready before the baby comes, it can be confusing and overwhelming. Here are the main reason’s a parent should strongly consider Organic Crib Mattresses for their newborn. Flame Retardant Chemicals – These primarily include Phosphate, Brominated, and sometimes Chlorinated or Antimony Flame Retardants. When a chemical gets undue attention, and certainly if it gets banned, manufacturers tend to turn to other flame retardant chemicals. But these substitutions are frequently known as “regrettable substitutions” because the new versions generally prove to be no better than the previous versions. Various flame retardant chemicals have been associated with toxicity, mutagenicity, carcinogenicity, developmental issues, endocrine disruption, and reproductive issue, etc. Phthalates – Phthalates are used to soften vinyl, and are linked to cancer and developmental issues. Six phthalate chemicals were banned by Congress several years ago (as part of the Consumer Product Safety Improvement Act of 2008) and a seventh has been added to California Prop 65. Meanwhile, there are at least an additional seven or eight new phthalate versions now on the market, as well as other phthalate substitutes, which are technically legal (i.e. not banned) and are being used. No one knows the effects of these substitute chemicals, and whether they will ultimately be shown to have better or worse or substantially the same health concerns. Why an organic crib matteress, because iIt is estimated that there are 84,000 chemicals in the market place today, most of which have not been tested for their toxicity level. Tissue and blood samples show that the chemicals in mattresses have shown up on the blood and tissue sample results of infants. The mattress off gasses and baby breathes these gasses into their lungs which leads to a multitude of illnesses or health issues. Where are the flame retardants found? They can be found in the surface fabric of a crib mattress, and/or in a flame barrier directly beneath the surface fabric, and/or in the foam inside the mattress. Most synthetic fabrics on the market are flame-resistant because flame-retardant chemicals have been added into the fibers when the synthetic fibers were made. In the case of natural fabrics, being that the fibers themselves are natural and not synthetically created, the flame-retardant chemicals are generally added at any of several later stages of the fabric processing. Many parents think that bed sheets will keep the child from inhaling the chemicals. However most sheets have chemicals as well, and the sheets do not keep the off gasses from being inhaled by your infant. This is why an organic baby crib mattress is so important. Infants spend up to 14 hrs a day sleeping. Our organic mattresses are non-toxic and fire retardant is chemical free, other natural substances are used such as common baking soda and does not off gas. Spring cleaning happens this time of year when the weather gets warmer. It’s great to open the windows and air out the house. The problem with cleaning is the mainstream cleaning products are toxic. The air is fresh and everything looks sparkling clean, but what toxic chemicals are being breathed in by your family and pets? Mainstream cleaning products can have anything from petroleum based chemicals to formaldehyde and chlorine. Cleaning products have been linked to asthma, allergies, MCS and a host of other ailments. Cleaning with non-toxic Green Cleaning products can do the same job, without the harmful side effects of the mainstream chemical counterparts. Using non-toxic cleaning products helps your family breathe easily. 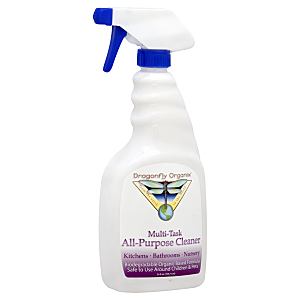 Using our Dragonfly Organix cleaning products you’ll feel safe, clean and help the environment. Green cleaning products also help the environment as well, by using ingredients that aren’t harmful to the earth. Green cleaning products are as cost effective as the mainstream cleaning products. You can trust that with small children around the house it feels so much safer having products that don’t have a poison sign on them. Products that won’t cause breathing issues, or allergies. Children’s systems are vulnerable while they developing, using products you can trust are safe helps parents rest easy.